A transporter accident reduces Captain Picard, Guinan, Keiko, and Ensign Ro to children right before the ship is hijacked by Ferengi mercenaries. If Picard values these 700-year-old artifacts and is amazed that they are still largely intact, why is he handling them with his bare hands and passing them around like family photos? That's the second time Guinan has mentioned her father, and this time, she hints that he's still alive. I really want to know more about this guy. 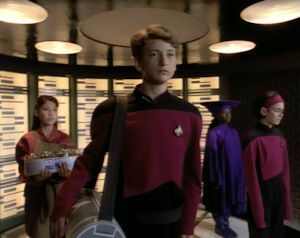 The actor who plays the young Picard--David Tristan Birkin--is the same actor who plays Picard's nephew René in "Family." The Ferengi taking the Enterprise using two old birds of prey doesn't make a lick of sense. I understand the plot requires it to happen quickly, but surely they could have come up with a Ferengi trap that's a little more plausible than that. Additionally, the ship undergoes massive damage--nearly losing life support--but it doesn't really seem like it; the lights are still on full, the ship barely even rocks, and we see no carnage. I'm glad they recruit Alexander. With him, Keiko, Guinan, and Ro all playing important roles in this episode, the show is letting us know that the secondary characters are still important. That's an impressive bit of improv technobabble from Commander Riker. This story shouldn't work, because the premise is ridiculous. However, despite unforgiveably questionable plot points, it does work. The writers are careful to treat the situation with a perfect balance of seriousness and humor, to explore the character ramifications of these four people suddenly becoming young again while letting the absurdity speak for itself. Whether it's Picard dealing with how to command authority as a twelve-year-old, Guinan teaching Ro the value of having fun as a child, or the harrowing consequences such a drastic an awkward change has on Keiko's family life, the premise is surprisingly fruitful. It's even used as a plausible thematic solution to the show's secondary problem (the Ferengi hijacking). Also a surprise is how well the child actors perform; they each do a remarkably good job for actors their age to channel the styles and personalities of their adult counterparts. This silly episode has no business being as good as it is, and yet I love it.